The IJ tram links Central Station with IJburg. All shelters along the route have a standard design by the NPK firm of industrial designers, yet the way they are placed picks up on characteristics of their immediate surroundings. 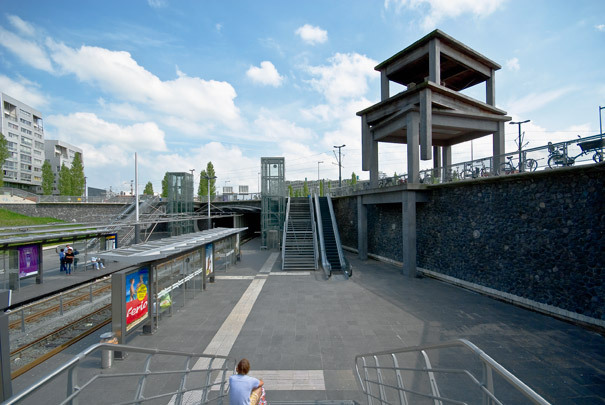 Alluding to the tram's route through the Piet Hein Tunnel, the stop at Rietlanden is sunk six metres below street level so that the IJ line intersects with a second line above it. Here at this traffic hub is an art work consisting of four gigantic household tables, rotated relative to one another to represent the different traffic flows. Beehives hang below the uppermost table, contributing another, largely invisible layer of traffic.